The subject I am going to approach in this message is an unusual subject. I have felt to go over this subject for the last few weeks. I remember the first time I ever heard anything like this was in 1961 when Bro. Branham had just preached a sermon where he explained there is no eternal life in hell. I remember Bro. Jackson preaching on this. After the passing of Bro. Jackson, I preached one message on this one Sunday morning. This was within a year or two after Bro. Jackson had passed away. Bro. Bud and I were working near Bro. Jackson’s house, and he went to see Sis. Jackson. She spoke about how much she appreciated that message. That was kind of a wakeup call for what I had to do from there on in order to fulfill the plan of God. This is a subject that will not bring you salvation, but it might cause you to look at things a little different in life, because it has not been used too much. But I remember when I first heard it in 1961. At that time there was another preacher who was a retired Methodist preacher, he was riding in the car with me. It was when we first heard about Bro. Branham, that is when he preached it. This was one of his messages that he preached to bring in the last day message. Of course, we had always heard that hell was eternal punishment. Whenever this preacher heard it said that it was not eternal, then he said, “Well if you say it is not eternal, people are not going to be worried about going there.” But Bro. Branham said the punishment could last as long as it would take for a sparrow to move the ocean from one place to another. That makes it sound a little disturbing. Because a little sparrow would take a long time to drain the ocean. But there is a limit on the time, and he made the statement on that to express just how long that time may be. He said, if a person in hell was there for eternity, then there would be some type of eternal life in hell. But we know there is no eternal life outside of God. One thing that can help us understand hell is not eternal is that we find it was created and after the creation of the world, and it was created for a purpose. It was not always there. We are going to get to that, to see when it was created and the purpose it was created for as we go through this message. It may seem a little strange for me to go into this message at this time, but there are many people that have never heard it. There are people even here, that have been Christians for a short length of time, and you have never heard this message preached. It has always been thought of as something eternal. There is a punishment for every one that goes there. Some will get greater punishment than others. We want to look at some of these things as we go into this because everybody is not going to be there the same length of time. Everyone has a spirit, and the spirit of life is from God. Every one that breathes today has had a taste of the spirit of life. In the 1st chapter of Romans, it explains that because of that spirit of life that God gave there is a realization in everyone that there is a higher power. That power is God. This is why man has always sought something to worship. They worshipped animals and every little thing in the world that they can make a god out of. The scripture speaks plainly against worshiping things that are made by hand. Men love to make some kind of object and then they worship it. As it is explained in the book of Psalms, it has eyes but cannot see. It has a nose but cannot smell, a mouth but it cannot speak. It is just a figment of man’s imagination. But it goes to show, there is something in them that recognizes there is a God. In America today, we have many spirits that worship different religious forms that came out of different countries, especially these eastern countries. They believe in reincarnation, where in their next life they may be a bug, or maybe a drop of water. Man that believes stuff like that think they are smart. That is dumb. There is no smartness about that, to think you are going to come back as an ant or something. That is the reason in India that they sweep them off the streets with a broom. It is not funny to see that people have been duped. It is sad. It is not something that just started yesterday. It is something that is steeped in ignorance that caused people to worship strange things, and call them gods. But we worship one God, the living God that brought life to us, and also gave us eternal life. Eternal life: there is no end to it. Whenever you are talking about something eternal, you are talking about God, because there is no beginning. You cannot look back in time and find the point at which God began. We look at everything as though it had a beginning, but with the infinite and eternal God that we serve, there is no beginning and no end. He is eternal. But we find it is not so with Hell. It is something that had a beginning when he created it. So I have given you a little preview of my message. I will first look at some related things before I get into the main part of the message. I want to go back to Genesis 1:1. “In the beginning God created the heaven and the earth.” Period. This is the beginning of time. Time never started until God, in the beginning, created the heaven and the earth. There was a beginning. Before that, it was eternity. God has always been in existence. There is no beginning to Him, there is no end. The Bible here speaks expressly, that in the beginning God created the heaven and the earth, period. Bro. Branham was told by a scientist, “We believe the earth is a billion years old.” Bro. Branham said, “What about that? That does not mean anything.” He said that because this one verse talks about whenever the heaven and earth were created. It does not say how long ago. In the beginning God created the heaven and the earth. Why did not it mention Mars, and all these other planets and stars? Because God had a plan for the earth. He had a place that man would inhabit: the earth. I know there are thoughts about other planets and outer space. God has it in control. The thing about it is, I will not preach on what is up there, because I do not know. The only thing I want to preach is what God has put upon this earth. That is what God is concerned with here: it’s beginning and what is fulfilled thereafter. In the 2nd verse it says, “And the earth was without form, and void; and darkness was upon the face of the deep. (Deep, that would be space. Darkness was upon the face of the deep, outer space.) And the spirit of God moved upon the face of the waters.” Whenever the heaven and the earth were created, God put a canopy of water circling the earth. That is where the flood came from. Whenever it talks about it in Genesis 6, it says that the deep was broken up. It was broken up, because before that there was no ocean. There were lakes, but there were no oceans before the flood came. Then whenever the flood came, God just covered the earth with water. It had to go someplace, so that is the reason seventy five percent of the earth is covered with water, because God gathered the water. It said He gathered the waters together. As we look at that, we want to think about some of the things that went on in the beginning. God created the heavens and the earth, the earth was one big ball of rock, just stone. Bro. Jackson taught on these things, and there are Contenders and sermons where this was brought out to the people. I will not go into all of it, just enough to bring it to your remembrance. He said there were little particles of life, like little bugs and things, they began to eat on the minerals of the earth and the secretion from their bodies began to break down the fiber of the earth to make it to where, after millions of years, the earth became more and more habitable. God is patient. God is not looking at time like we are. This earth in verse two is not like the earth when it was originally created. You see the earth in verse two is after God cursed it. He made it void. There was a creation here before man, ruled over by the angelic family. But God brought judgment upon this earth somewhere in time, after the animal kingdom had been upon the earth for a certain length of time. It talks about Satan, in his beginning, that he was perfect. Then iniquity was found in him. Iniquity: something that he began to gather within himself, to make himself as God. That is in the scripture. So as we look at that, I was thinking about the different things that maybe could have went on, but things that did go on, to break this earth up. Of course there was water upon the earth, but there was not floods of water, there was not rain. Those things came about whenever the second judgement came. The first was a freeze, the second was water, and the third will be fire, which will be in a short time as we believe it, according to the word of God. Now you go into the second chapter, verses 1 through 6, “Thus the heavens and the earth were finished, (That is talking about the six-thousand-year period of time. This is getting to where the earth was going to be inhabited again, because the earth was frozen stiff, let’s put it that way. Thus the heavens and earth were finished…) and all the host of them. And on the seventh day God ended his work which he had made; and he rested on the seventh day from all his work which he had made.” The creationists say that God created the heaven and earth in six 24-hour days. It is actually six periods of time. I remember Bro. Jackson asking, “How could it a normal 24-hour day when the sun and moon, which are what we measure a day by, were not seen until the fourth day?” It is expressed in the scripture that day to the Lord is as a thousand years. This restoration of the earth took awhile. “And God blessed the seventh day, and sanctified it: because that in it he had rested from all his work which God created and made.” Now here is the proof. This verse is proof that it was not just six 24-hour day. “These are the generations of the heavens and of the earth when they were created, (The generations. He measures the time in generations.) in the day that the Lord God made the earth and the heavens, And every plant of the field before it was in the earth, (Before it was in the earth. Nothing had actually started to grow yet. Every plant of the field before it was in the earth…) and every herb of the field before it grew; for the Lord God had not caused it to rain upon the earth, and there was not a man to till the ground.” See? There was not a man to till the earth yet either. You go through seven days and you still have nobody to till the earth and no plants growing yet. But it was generations of time that passed. God was getting things ready. “But there went up a mist from the earth, and watered the whole face of the ground.” Like a dew. This is where the water came from at that time, because it had not rained. This is how the plants were watered. The great waters that would form the oceans was still in the deep at that time. So this is the condition of the earth as God is restoring it. We see God restoring this earth in Genesis, but what caused this earth become cursed? I go back now to where I began, to the creation that came before man, where Satan fell and where he had his dilemma. Because something else is also being prepared and made ready. Let us go to Matthew 25:40. “And the King shall answer and say unto them, Verily I say unto you, Inasmuch as ye have done it unto one of the least of these my brethren, ye have done it unto me.” He is talking about the righteous saints there. “Then shall he say also unto them on the left hand, Depart from me, ye cursed, into everlasting fire, prepared for the devil and his angels.” Hell had a beginning. It was not prepared for man, because there was no man upon the earth. God had not yet created man. As we look at this earth, there is no way they can truly measure the age of this earth. There is no way they can truly measure the heavens. They say the earth may be five billion years old. They have a way they arrive at their estimates. I do not dispute them. We do not know with certainty if they are right, but God does. We will understand, as the song goes, better by and by. But that is not important to this message. The bible gives you a time period that lasted for generations. As we go back to Genesis, you will find in that second chapter, that God had only created the spirits of man on sixth day, then He rested that seventh day, the seventh thousand years. God rested. Then He began the time of man, which has lasted about six thousand years, and we are getting ready to go into the Millennium, which will end the time for man, as far as time is concerned. After that everything is going to be eternal. Because everything will take of the tree of life. Everything. “Then shall he say also unto them on the left hand, Depart from me, ye cursed, into everlasting fire, prepared for the devil and his angels.” You will find as you read on in Isaiah 5:14 that it says “Hell hath enlarged her mouth.” So not only did it have a beginning, there was a time when it was made larger. “For I was an hungered, and ye gave me no meat: I was thirsty, and ye gave me no drink.” This is a scripture they try to say applies to the day we live in, but it has nothing to do with this time. They try to use it our time to get us to donate to feed the little cats and little dogs, and little children. They have mixed it all up until the animal kingdom looks just as important as a little baby. It is not. Animals do not have eternal life. This verse is not a feeding program for this time. This verse is speaking in reference to the time of tribulation. “I was a stranger, and ye took me not in: naked, and ye clothed me not: sick, and in prison, and ye visited me not. Then shall they also answer him, saying, Lord, when saw we thee an hungered, or athirst, or a stranger, no naked, or sick, or in prison, and did not minister unto thee? Then shall he answer them, saying, Verily I say unto you, Insomuch as ye did it not to one of the least of these, ye did it not to me.” See? That is based on the tribulation time. These are natural people still alive on the earth after the Lord returns. Insomuch as ye did not visit or do something for that poor soul that was in prison, or that was sick, or whatever the cause would be that they could help, they turned their backs. Because He said, inasmuch as ye did it not to one of these least of mine, you did it not unto me. Now listen to what He said. “And these shall go away into everlasting punishment: (Everlasting, remember that word. These shall go away into everlasting punishment. Listen to the words.) but the righteous into life eternal.” Look at the difference there. Everlasting, and eternal. Eternal life is for the righteous. But what is this everlasting punishment? Go to 1st Thessalonians 1:8-9. In flaming fire taking vengeance on them that know not God, and that obey not the gospel of our Lord Jesus Christ: Who shall be punished with everlasting destruction from the presence of the Lord, and from the glory of his power. It is a period of time. The wicked will end with destruction. Everlasting destruction. Destruction is when nothing is left. We will go over this more, and prove by the scripture that wicked do not have eternal life. They will finally be destroyed. It may take as long as it takes a sparrow to move the ocean, but it will happen. So as we look at that, I am reluctant to put too many pictures of Hell, but I do have one. Let’s go to 2nd Peter, chapter 2. “But there were false prophets also among the people, even as there shall be false teachers among you, (Notice what he is saying there. There were false prophets among the people in the old times, and there will be again in the end.) who privily shall bring in damnable heresies, even denying the Lord that bought them, and bring upon themselves swift destruction.” God paid a price for them, because it said they will be among you. They will deny the Lord that bought them salvation, but it will bring swift destruction upon them. “And many shall follow their pernicious ways, by reason of whom the way of truth shall be evil spoken of. And through covetousness shall they with feigned words make merchandise of you: (If we let them, they will treat us like we are just a piece of meat, just some garment to them that is worth throwing away. They will make merchandise of you.) whose judgment now of a long time lingereth not, and their damnation slumbereth not. For if God spared not the angels that sinned, (Here we go back to the beginning, to something that happened before our creation.) but cast them down to hell, (There they still abide today. There are some angels that were so violent that God shut them up until the day of judgment. There are certain places in this earth that is uninhabitable because there was such a curse upon that part of the world, where man cannot exist, like Death Valley and places like that, where angels have been so rugged and rough. I think about the old world (Europe). I have seen pictures of the old world, like England and different places like that. I thought whenever people talked about the old world, then they were looking at something where it is barren and nothing will grow, but then whenever I saw Ireland, I found that it is a beautiful place. I flew over it by plane. It looked like the land is blocked off in places to where it is so beautiful. That world is no older than America, which we call the new world. It is just that men have lived there longer, but it did not affect the ground on which they lived, because why? Because things had not gone on there as they have in other places. Every region in the world has their deserts.) For if God spared not the angels that sinned but cast them down to hell and delivered them into chains of darkness, (chains of darkness, which they never see the light. They are waiting for their time of judgment. Some are waiting their time for when God will loose them again according to Revelation 9:1-2.) to be reserved unto judgment; And spared not the old world, but saved Noah the eighth person, a preacher of righteousness, bringing in the flood upon the world of the ungodly; And turning the cities of Sodom and Gomorrha (God does not accept the homosexual lifestyle the world has embraced. God does not like it. That is what was going on in Sodom. Therefore He sent two angels there. They led three people out of the city to safety, the rest of it was destroyed. It is under a pile of ash today, destroyed by fire spewed out of hell itself. It rained down in sulfuric acid and stones, which are found today over there around the Dead Sea. Turning the cities of Sodom and Gomorrah…) into ashes condemned them with an overthrow, making them an ensample unto those that after should live ungodly.” An example to those that should live after their lifestyle. My! Turning the cities of Sodom and Gomorrha into ashes. When you go back in scripture, you see what a bad bunch of characters they were in Sodom. Two angels that looked like men, came in among them. They said, bring them to us, let us know them. They desired to abuse them. That is how society was in Sodom. It is that way in America today. Anything that is done right they condemn. Take these marchers in the news recently, the high school kids walked out of school the other day and they get on the microphone. A young girl begins to curse, right on the microphone. Why did not her did parents not take her home and wash her mouth out with soap? I would not have done my mom that way. She had a bony hand, and I would have felt it. And she should have let me have it if I did that. Five of them were on television were speaking to the news. They were talking about swearing. Two women and three men, they were discussing if it was possible to go one day without swearing. “I do not think I can, everybody swears,” they said. Everybody does not swear. My mom told me something when I was young. She said, all the sins that a person does, they get something out of it, but to curse, you get nothing out of it. I practiced that, even when I was a boy growing up. I remembered what my mom said. It was something that stuck inside me. What good do you get out of cursing? Oh, well just let it slip. We do not have to think like that, we do not have to get angry like that. Let it pass, let it go. Let’s go to Ezekiel 28, verse 12. God is speaking of Satan here. “Thou hast been in Eden (Which was the Eden of God, before this creation ever came. Thou hast been in Eden…) the garden of God; every precious stone was thy covering, (Showing when God created this earth, it was so intense with heat. That is why you have the beautiful stones, because of the intense heat and pressure. You see it in this verse. Thou has been in Eden, the garden of God, every precious stone was thy covering. Look what he had. Look what these preachers have today. I saw on television, this man built his church and spent a million dollars on the entrance where everyone came in. They had this thing where fish, big fish, were swimming around the door. Why would somebody want something like that? They say, “Oh, look what I have done.” You have done nothing, you made a fool out of yourself. Every precious stone was thy covering…) the sardius, topaz, and the diamond, the beryl, the onyx, and the jasper, the sapphire, the emerald, and the carbuncle, and gold: the workmanship of thy tabrets and of thy pipes was prepared in thee in the day that thou wast created.” In the day that thou wast created. He was a created being. Listen to Ezekiel’s prophecy as he goes on. “Thou art the anointed cherub that covereth; and I have set thee so: thou wast upon the holy mountain of God; thou hast walked up and down in the midst of the stones of fire.” See the creation where he was? Listen. “Thou wast perfect in thy ways from the day that thou wast created, till iniquity was found in thee.” God does all things well. Satan was not a devil at the time he was created. Satan became the devil whenever he left his habitation. It said in that 14th verse, “Thou art the anointed cherub that covereth; and I have set thee so: thou wast upon the holy mountain of God; thou hast walked up and down in the midst of the stones of fire. Thou was perfect in thy ways from the day that thou wast created, till iniquity was found in thee. By the multitude of thy merchandise they have filled the midst of thee with violence, and thou hast sinned: therefore I will cast thee as profane out of the mountain of God: and I will destroy thee, O covering cherub, from the midst of the stones of fire. Thine hart was lifted up because of thy beauty, thou hast corrupted thy wisdom by reason of thy brightness: I will cast thee to the ground, I will lay thee before kings, that they may behold thee. Thou hast defiled thy sanctuaries by the multitude of thine iniquities, by the iniquity of thy traffic; therefore will I bring forth a fire from the midst of thee, it shall devour thee, and I will bring thee to ashes upon the earth in the sight of all them that behold thee. All they that know thee among the people shall be astonished at thee: thou shalt be a terror, and never shalt thou be any more.” The end. Thou shalt never be any more. See what I was talking about? There is no eternal life for those who go to hell. Let me read that last verse again. “All they that know thee among the people shall be astonished at thee: thou shalt be a terror, and never shalt thou be any more.” It is over, you are gone, you are dust. That is why I said what I did before. Whenever God finishes His judgment the wicked will cease to exist. This great Satan that is above all the wicked angels, who is the most wicked and evil of all, it shows that even he has an end. He does not have eternal life. In hell, his life will eventually be extinguished. The length of the judgement and punishment will be based on the deeds of the wicked. I want to say this: the ones that reject truth will receive a greater damnation than the drunk or the homosexual. We find that in Matthew 11:21-22. That is not pleasant, but that is the truth. That is one of the worst things that a person could do. It said the dog has returned to its vomit, and the sow to her wallowing in the mire, which was once washed. So today as we look at these scriptures, I know it is nothing to shout about, but it is in the bible. If it was not in there, it would not need to be heard. But there are a lot of people that may be wondering or have never heard these things concerning hell. When you go into a subject like this, you have scriptures that relate to a time even before mankind was on the earth. Even a time before time began. That is why in Genesis 1:1 it says “in the beginning”. When you mention the beginning, then you are starting time. As I look at that and look at scriptures that transpired in God’s creation before man was here, I can see He left us enough in the scripture to serve as a reference. It is enough to where we can see a scene. I do not want to say a story, because I am not a story teller. But I believe there is a truth in the word of God that can inspire a picture in the hearts of those who hear and believe. I know when I preached the sermons on the third day, there were preachers that laughed in the pulpit about what I said. But it has proven to be a fact throughout the years and through time, because it has been ten years ago when I first preached it. I preached it at first, then it began to blossom and get bigger and bigger in people’s minds, to where by the time of the fall meetings in 2008, then it had all come about. I was thinking about that I listened to Sis. Noleen sing here in our service. She and her family were left with nothing to go on by Deva Govender. I am not a person to mention names too often, but he left them nothing to go on because he did not want anybody to know about our website or online services. I learned that when we first went to South Africa as related by our brothers and sisters there, that they were not really given any knowledge of these things and they had to search it out themselves, to find out that there was still a ministry that was carrying truth. Truth cannot be hid. Whoever it is going to reach, it is going to find its way there through all the crooks and crannies of time. It is going to find its way to the hearer, because the Bible said, “Let him that hath an ear to hear, hear.” This is what we have presented in this hour of time. We have presented a truth to a people that were able to hear. It is not for the world because the world is going to turn it down. It is not for those that would not listen. Jesus spoke in parables in Matthew 13. The disciples asked Jesus, why do you speak in parables? He said, “That hearing they man not hear.” He spoke in a way that they could not understand on purpose. He preached to many thousands of people, but yet there was a hundred and twenty in the upper room. Through all Israel he preached. Elements of all the tribes where there to hear, they were there in the time that Jesus was there. They heard John the Baptist, then they heard Jesus speak the truth as He did. They did not want anything to do with it. If it was that way with Him, then what about us? We are just mere creatures of a truth that He has brought unto us in this hour. Whenever we look at the word, it says there would be a falling away. And there has been. People have turned away their ears from the truth. As we have preached, and as it was preached before us, there has always been an avenue where people might be able to hear truth, those that had ears. Especially in this last day. The book of Luke says the gospel would be published. At this time and back in Bro. Jackson’s time, it was not only published in paper form and tapes, but it was published through the internet. So we have that today to look at. We see the progression of the word of God. Everything progresses. It must. There will be those that will know the truth, and the truth shall make them free. So we are made free by the truth of the living God today, by His word that He has revealed unto us. I want to go to some scriptures now to show you what it was like before our creation, before mankind was on the earth. You say, well how are you going to do that? We are going to look at the progression of things before man come upon this earth. There is something that happened. You can see it in what we have already read from Ezekiel. There was something which happened that God did not like. Satan exalted himself to make himself above the stars of heaven. There are only three angels’ names mentioned in the Bible: Gabriel, Michael, and then Lucifer. Lucifer was one of the first angels that was created because it called him the son of the morning. So he was in the early part of the creation, because he came to exist in the morning of the creation, which would have made him one of the first in line to be one of the archangels. Whenever we look at the scriptures, if we look at time past, these men that God raised up were very intelligent in the things of God. I am sure they knew the scripture very well, what scripture was available in their time. I am speaking about the first books of the Bible and so on, Joshua and so on, until you come to the time of Isaiah, Jeremiah, and those others. Because Moses even spoke and said there would be someone who would be raised up like unto Him. He was talking about another law giver, a law of grace. In Isaiah 14, we will start with verse 9. “Hell from beneath is moved for thee to meet thee at thy coming: it stirreth up the dead for thee, even all the chief ones of the earth; it hath raised up from their thrones all the kings of the nations. All they shall speak and say unto thee, Art thou also become weak as we? art thou become like unto us? Thy pomp is brought down to the grave, and the noise of thy viols: the worm is spread under thee, and the worms cover thee. How art thou fallen from heaven, O Lucifer, (See? How art thou fallen from heaven, O Lucifer…) son of the morning! (That is what I was talking about: son of the morning. The early created angel is what he was, because it said here, son of the morning.) how art thou cut down to the ground, which didst weaken the nations! (This is speaking of his coming judgement.) For thou hast said in thine heart, I will ascend into heaven, I will exalt my throne above the stars (or the angels. He is not talking about the Milky Way galaxy. I will exalt myself above the stars…) of God: I will sit also upon the mount of the congregation, in the sides of the north: I will ascend above the heights of the clouds; I will be like the most High.” Listen to him. These are Satan’s words. He is exalting himself. “Yet thou shalt be brought down to hell, to the sides of the pit. They that see thee shall narrowly look upon thee, and consider thee, saying Is this the man that made the earth to tremble, that did shake kingdoms; That made the world as a wilderness, (Now we seeing something: that made the world a wilderness. That would be speaking of the time before man was put on the earth.) and destroyed the cities thereof; that opened not the house of his prisoners? All the kings of the nations, even all of them, lie in glory, every one in his own house. But thou art cast out of thy grave like an abominable branch, and as the raiment of those that are slain, thrust through with a sword, that go down to the stones of the pit; as a carcase trodden under feet.” This is the explanation of who Satan is, and what happened in his past. I want to go back to Genesis chapter 1:1. “In the beginning (This is when time began. This is the very beginning of time. Before this, there was nothing to be seen. There was no earth, there was no heaven. There was no stars. In the beginning…) God created the heaven and the earth.” He created the heaven and the earth. This was the very beginning. I keep repeating this: this is the very beginning of time as we count time. Before this, it was eternity. People have wondered, where did God come from? That is a foolish thing, because it said from eternity to eternity, thou art God. So there is no beginning of God, there is no ending of God. So why would this world just be six thousand years of age, if God had no beginning? A billion years is nothing to God. I know they have this attraction down in Kentucky with a so-called replica of Noah’s ark and all, they have all the animals in there. They were all created in six days they say. They even have dinosaurs in the ark. I want to get to that later. But that did not happen in six days. There earth is very old, and there was a whole creation here before man. “And the earth was without form, and void; (In other words, there was nothing on it. The earth was without form: it was just a big ball of stone without form and it was void. It had nothing on it. That could have lasted millions of years until the thing began to cool. Because the inner core of the earth is a ball of fire. 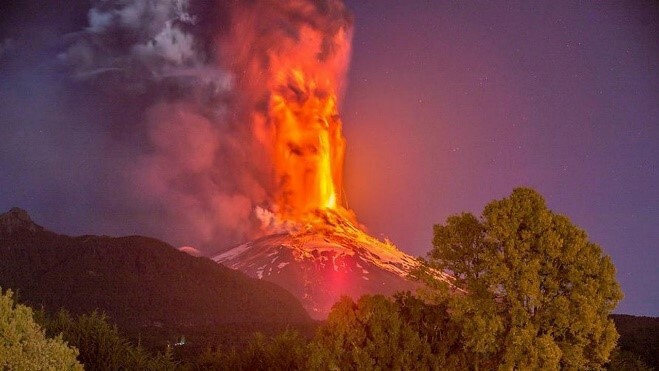 You see this in volcanoes around the world. There are volcanic mountains around the earth. I feel that whenever God blows this thing during his wrath, when it says the mountains will disappear, I feel that this is what He is talking about, because of the great explosion that Peter saw, God has it all under control. People are wondering, what is going to happen here if this big volcano out west at Yellowstone, goes off. It cannot be, because God has a control button that He is using to where everything is going to fit exactly like He says. Let me say this, it is kind of like these old farmers used to be when they had sage grass fields. God has a control fire. If you are a farmer you will understand what I mean, but there are a few that will remember the control fires. That control fire was to get rid of the sage grass and stuff that was a hindrance to a crop. That was burned off. As I said, God has control of all this. He is saving it for a purpose. Look at Genesis 6, “And it came to pass, when men began to multiply on the face of the earth, and daughters were born unto them, That the sons of God saw the daughters of men that they were fair; and they took them wives of all which they chose.” They would just see them and choose them. They were there for the picking, kind of like it is now. Because it said, as it was in the days of Noah, so shall also the coming of the Son of man be. “And the Lord said, My spirit shall not always strive with man, for that he also is flesh: yet his days shall be an hundred and twenty years.” Now this next verse I want to use to go back in time to the early creation. “There were giants in the earth in those days; and also after that, when the sons of God came in unto the daughters of men, and they bare children to them, the same became mighty men which were of old, men of renown.” What happened? How did there get to be giants? They began to mix. Satan likes something big, because he thinks big. Did you ever see pictures of Samson that make it look like he was a big giant of a man? Samson was not that way. That would not show God. Samson was a little ruddy man, red. The thing about it, it was the spirit of God that came upon him. It said that about Samson, that whenever the spirit of God came upon him, there was nothing that could stand before him. He could beat an army. He took an old jaw bone of a donkey and killed a thousand people with it. You might think, that must have been very sharp. No, God was sharp. Whenever I look at Israel in this time, I do not fear for them. I pray for them, but I do not fear for them, because it said though all the nations of the earth come against them, yet He would stand for them. One man would be as a thousand. I want to establish this: “There were giants in the earth in those days.” What caused this? It was the intermingling of the sons of God and the daughters of men. They became attracted unto those degenerate half-animals that came through Cain’s line. Because of that, whenever they did come together, what happened? There came forth giants. Look at it in this day. So something happened. Whenever God created dinosaurs, they were not ninety feet long, they were not thirty or forty feet tall. No. It was that intermingling caused by Satan. You have their skeletons now, big, giant carcasses. I remember when Bro. Jackson preached the message about the prehistoric time. Walt Disney made a movie of the dinosaurs. They had to make pictures of lizards like we have today and enlarge that picture to take it these little creatures look huge. You can find these little creatures fighting each other in the desert. You can find them fighting now, but in time past, what happened? They began to grow. They began to get bigger, and bigger, and bigger. What was going on? Satan entered the picture and caused them to be beasts instead of animals that could be controlled. Just like it was before the flood. There was violence just like it is now, men with corrupt minds. But here you have an animal kingdom that Satan has entered into. God had to rectify that. He had to take care of it because Satan saw it and he wanted power. He thought the bigger they were, the larger they are, the more he would get out of it. These animals began to grow, they began to get bigger, and bigger, and bigger, because Satan likes bigger. He likes big churches, because God is not there, but man feels religious. Cain felt religious, so what did he do? He took a bunch of vegetables and was going to worship God with vegetables. God did not want vegetables, it had to be blood. Abel had a different father. Brothers and sisters, when you are born again, you have a different father. You have somebody you can call Lord. So Satan put violence in there. Cain murdered Abel. Satan likes violence. I just read where it said, until iniquity was found in him. In the beginning, in his beginning, he was a peaceful angel. But God gave angels a choice. He did not give them redemption. What is redemption? It is to bring back something which fell. The angels started out perfect. We started out sinners. God had to give us an outlet where we could come back to Him. But we find that when the angels fall, they have no outlet. They just fall because they were perfect in their beginning, as Satan was. Satan, in his beginning, was perfect. He had all the angels that were under him. God always has an order how He wants things run. It is not because you are smart or that you are intelligent. You can tell that by me. But it is because God deals with you in a way that lets something go down inside you, to pull out the things that He would have done in this hour of time, that He is doing with His ministry. Why? God does not just show a ministry something for nothing. He shows it for edification to the saints of God. I would like to say to my brothers and sisters from South Africa, from Canada, and other places: God has brought you this way because one day He spoke through all the voices, which were many, all the voices you heard, but there was still something in there that was not satisfied. It is like they talk about the little eagle that grew up with the chickens. He never could cluck. He would see the others walking around, eating grain, eating gravel, a chicken has to have gravel. That is what the craw is for. Did you know that? That is what the craw is for, the food goes in there and it grinds it up. It is a grinder, that is what it is. The thing about it is, that little eagle, it could never sound like a chicken. But one day it heard it’s sound coming from on high, and it related to that sound because it was the mother eagle. It related to that. All at once, as its wings had been growing, all at once it begins to fly. Here we are in this endtime, learning our wings are to fly, not just to drag around. There are islands where birds have wings, stubby wings, but no feathers. They have wings but they cannot fly because they have no predators. We have predators. If it need be, bring it on. The devil is a defeated soul. Oh, he pops up, he wants us to think we have no authority. I am not out here cursing devils. They have their purpose. It is very dangerous, as Bro. Branham said, to rebuke spirits if you are not anointed to. Every preacher is not anointed to. I have heard one older preacher say “I rebuked that devil until sweat came out of my shoes. I rebuked it until sweat came out of my shoes, and it was two o’clock in the morning.” Jesus, when He went into the mountain there to pray and fast for forty days, He always had a scriptural answer. Finally at the end, He said, get behind me Satan. What happened? It said it left Him for a season. It did not leave Him always, no, it came back in another form. It came back as a spirit upon the people who tempted him and criticized him. They said “This man is Beelzebub,” but they were living a devilish life and calling Him something of that nature. What did I read in Matthew 25:40? It said that hell was made for the devil and his angels. It was not made for man. Whenever God created the heavens and the earth, what did He say? After the sixth day, what did He say? It is good. God made everything good. As the song goes, God does everything well. He did not ask anybody how to do it. He did not ask anybody how to make mountains. He did not ask anybody how to make the rain. God is sovereign. In the beginning God, with no help, said let there be firmament above earth, let there be a heaven, let there be an earth. I wonder why He said it that way? It was because He had a plan. He had a plan for this earth. When we leave here, are we going to live in our little mansion? No. That is not going to be enough room. What does it say? We will be kings and priests, to guide a people, a natural people that is born upon this earth, with the Bride of Jesus Christ, Him giving the orders from His lofty position. God, whenever He saw what Satan was doing to pervert creation, He put a stop to it. It went on a long time, just as this generation has gone on a long time. God sees the fallacy of man, his falsehood and what he is doing unto a generation in time. That is why I have said there will not be another generation of preachers. What you see is what you get. As ministers of God, we are doing our best, as in Ephesians 4, to present a Bride to Jesus Christ that is acceptable. Brothers and sisters in South Africa, the devil could not keep it hid. I am not calling anyone a devil, but the devil works through people. He worked through an animal kingdom to make them big and strong and to eat one another. That was not God’s plan for the beginning, to kill. Satan was getting a thrill out of it, but his thrill is about to come to an end now. God is going to shut him up, just as I read about angels that left their first estate, they are shut up, in prison. Some until the day of judgment. The Bible says, know ye not that ye shall judge angels. He goes ahead to correct that, seeing that we do so, we must in this hour, have a perfect mind and a perfect avenue unto the spirit of God, to let God’s leadership be in a ministry to direct the message from a ministry to His saints for perfection. It cannot come about until there is unity. Things are getting more united at all times. Please brothers and sisters, let God work in your homes. Let Him work in your children. Do not let the devil get a hold of the lines because he will wreck your home. He is very much alive in this hour, but he sees his day coming. He is going to be cast down to the earth and then he knows he does not have much more time. He will cause there to be hell on earth for three and half years. Then, for a thousand years, he will be penned up in the bottomless pit, just like many of his cohorts are now. There are devils that bother you from time to time, because the devil has his cohorts working, that is what brings temptations. That is what causes intents of a person’s heart to be the way it is in this hour of time. If Satan can do that, what did God do when it got so bad? Animals got so rough, when they got so big and they became bullies to the other animals, then everything, everything became corrupted. God had to judge the animal kingdom according to what is inside them. What did He tell the children of Israel when they went in certain places in Canaan; He told them to kill every animal. If something like this happened today, they would say, oh my. Because what they want to do, they want to go back to the Old Testament and say the God of that time was not the same God of this time. It is, it just has a time period, then it is going to close, God is going to close the door. Slowly it is shutting in this hour. You see the violence today just like it was in the beginning. Every week there is a shooting. Every week somebody is stabbed. Every week somebody is beaten. Because the devil is back at his old tactics he used before our creation ever started. Whenever God shut off the lights, He shut off the light to the sky, the sun, the moon. He angled them in another direction. Whatever He did, things suddenly, within a short period of time, began to die. Darkness covered the face of the deep. It was all shut off. Here the ice comes and begins to cover the earth. You read in the Bible that God, in the fifth day, He begins to bring life to the whales and different things. He did not have to re-create them. They are already there, all He needs to do is thaw them out and resurrect them. It said the water brought forth certain life, because they were already there, there just had to be the sun to come in and the moon to come in to give light. I love this word. I love the word of God because it is a light to my pathway, a lamp to my feet that I do not have to walk in darkness. Some do, thinking that their education has put them on a higher plane. God help us, awake our children, awake the little ones, but God, in this time period has shown forth a light just like He did whenever this thing began to thaw out. He began to let His light come down. Whenever it did, it began to show. What happened after that? It took six thousand years for this thing to be resurrected to where life could live on it again. Then the seven thousandth year, God rested, to let the earth begin to come out of its hibernation. Light always brings life. Light brings spiritual life. We do not have to walk in darkness as others. As the scripture says, we do not have to walk in that darkness because God is light and in Him is no darkness at all. So you see where darkness came from. When the Millennium comes, we will not need the sun for our light, we will not need the moon for our light. Because Jesus Christ will be our light, that God shines through Him upon us, to make the picture come to life. Whenever I say that, then whenever this began to happen, whenever it came that darkness began to leave, then light sprung up and God gradually, after many hundreds of years, after thousands of years, God begins to shine again upon this earth, before mankind. The earth went through seven thousand years, Peter said a day with God is a thousand years. That is where we get it. Through seven thousand years, God is bringing this earth back because it was such a frozen tundra. The darkness had been so deep that the earth, no doubt, was barren as Mars and these other planets, or as the moon, which is three hundred and some degrees below Fahrenheit. But then, what did the first astronaut say when they went up? One of them spoke and said there has to be a God. I look at all these other planets and they do not have life on them, but whenever I see the earth, he said it was a blue marvel. All the water and everything that is upon it, God, whenever He finally let it rain, then all this water came down. Then in the Millennium it will go right back up as a canopy. There will not be all this ice and cold. There will be winter and summer. There has to be. You have the pole system, the north and south pole, which will still be what will cause there to be cold, not like it is now, but there will be cold and there will be heat. But it will not be extremes. There are still places, glaciers now that existed during God’s bringing the light back, because the light did not hit them as it did other places of the earth which were to be inhabited. You have got to have that, because it is God’s air conditioner, to bring coolness. Otherwise we would be hot like other places. But God, through His mercy, put ice there that would be able to flow a certain amount of coolness upon this earth. It will be a perfect climate. God is going to take these deserts that the devil has worked in, and He is going to change them. A few years ago they had a big amount of rain out in the desert out west. They had a big amount of rain, what happened? All these beautiful flowers covered the earth out there. They were beautiful flowers. The seed is there. That is the way it was in the beginning. God planted the seed and let the sun rise to bring it to the surface. My, what a great God. I am trying to explain to you what a great God we serve. He took us from a cold, hardened condition to bring us into light that we might shed forth a light. It makes me happy. Praise the Lord. I have to look at. I do not like to say something without something to back it up. I know it could be said, well you are speculating on certain things, but I see things as they are in the earth, that have had a beginning and a creation, and a Creator who has created them for His own purpose. We are not the first ones that have been upon this earth, we are the first souls that God has put redemption in. You might say, “Well we are looking at something that has not been put in the Bible.” But it is something that is recognized in time, not in history but in time, because we are going back beyond history to look at the different things that were created. God is the Creator. God does all things well. He did not make some kind of mistake, but He had a purpose in everything because this earth was inhabited before our time. Then whenever our time came, it started with seven thousand years of time in God’s re-creation, when He began to make things to where it would be compatible for man to be able to live upon this earth, because there had been a judgment before that. A judgment that brought everything to a standstill, nothing was moving, nothing was living as far as breathing is concerned. But God is never defeated. We know the dinosaurs were upon this earth, because their footprints are still here, and their bones are still here. I am talking about the footprints of the different beings that were here before man’s time. They were here in the time of the beginning, before man. When you put it the beginning, God created the heavens and earth, then you start time. Because that is a beginning, a beginning of time. So we are looking at it in that way. As God is the Creator, there are still new planets and stars that are coming into existence, even to this day. God did not just make it all at once. He made it to where His plan would work, because things are still happening. Even today, it is still in progress. There are stars being born and there are stars that are dying. I looked through the telescope Bro. Steve had at one time, you can see the light beginning to go from these places. It does not happen in a day, it does not happen in a year, it happens in time. As we look at it that way, whenever God did create the heavens and the earth in the beginning, He saw a purpose for the earth that He did not see for the rest of the planets that we can see. Everything that is out there that we know about, is not habitable for man to live on. The thing that happened is that whenever God first created this thing, as the scientists say, through a big bang, then God’s laboratory began to work. So if we look at it six thousand years ago, as being the creation of the whole thing, then you cannot see how things would really happen in that length of time. What was God doing before that? He was there. He was there in eons of time. We really cannot relate it to time. Whenever He talks about that, then we relate ourselves as people that have had a revelation of truth, and been born again by the Spirit of God, then we are eternal beings. God saw us from the very beginning. He knew your name, who you would be, even before He had flung all of space out here. So that shows the vastness of His Creation, which cannot even be fathomed. He gave us a vast universe so we could realize just how vast he is. As we look at things of that nature, when God made the earth to where it could be inhabited, as Bro. Jackson said, there were little micro-organisms that began to make secretions and make it to where it was not just a big stone. This earth was not going to be just a big stone, but it was something to be inhabited because this is the only place known to man, that there was life. Genesis 1:1 says in the beginning God created the heavens and earth, then He skips far ahead in time, and many millions of years have passed by the time you come to Genesis 1:2. He skips down to where the Ice Age was coming to an end. God was getting rid of something that had infested this earth. But the earth was not removed, it was still here. Just like the earth, whenever it went through its first birth was whenever it began. Then Genesis chapter one begins to count off the days, which really, He was letting the earth begin to come back to a place that could be inhabited again. Whenever God saw that, He saw that it was good. It took six thousand years for it to happen, then the seven thousandth year, God rested, the seventh day. But religious man does not take that into focus. He thinks God made the earth in six 24-hour days. No it was not that way. These days were period of times, because the Bible calls that period generations of time. It was before man had anything to gauge time. He may say a billion years, but then that does not mean anything, because it could be billions of years. God has a great laboratory which He planned. God had nobody to counsel with, so He counseled with himself. He did not need inputs of man or angels, because they were not there. God was there alone. Why do we call Him Father, if He was not the Father of all creation? He was the Father of Jesus Christ, but He is your and my Father. Jesus told His disciples when they asked Him, how do we pray? He began, our Father which art in heaven, hallowed be thy name, thy kingdom come, thy will be done on earth as it is in heaven, not the atmospheric heavenlies, which we are a part of, which Satan was given this part of the earth. What did he do? He infected it with thinking. Whenever we begin to think without realizing that there was a plan, God had a plan in order to fulfill His purpose. It did not just start in one day. God did not just think one day, then He put all this out here together. No. It took millions of years for it all to be planned out before anything was ever inhabited. It took time. As Bro. Jackson said, which I believe he told the truth, these little microscopic beings which had life, but not human life, not animal life. They were the beginning of the dirt, of what we call different things, as you look at the earth, you can look at the ruggedness of it. If it had been whenever the great mountains and great things that happened, then there would have been nothing for man to inhabit, because he could not have lived through it. It took time for things to begin to happen, as we look at it in time. Every continent has a volcano on it. I know they have one in the Philippines that you can see, which is a little mountain like area. A round volcano just a few hundred feet high. These places were times when God began a curse upon the earth, because of the way that man had done. I am sure many of these things happened even before the Ice Age, which I said God just put His great air conditioner to work. Whenever He did, He turned the lights out. When He turned the lights out from the earth, everything froze over. What was the purpose of that? It was for judgment. He was judging the earth because of what Satan had done. As I read before, he began to meditate, he began to think that he was going to be as God, that he was going to be equal to God. Just like man wants to elevate something in his mind now, to show that he has authority over the plan of God. Man’s creation began about six thousand years ago, as we have counted time, because the thing about it is, this is where man’s history begins. There is no history from before that, but that is where history begins, where God begins to create His human family. Before that, there was an animal kingdom and there was an angelic family. As I said before, its footprints are in civilizations of all types. I remember Russia, there in Siberia, they unearthed this wooly mammoth. It was intact. They did this in Norway too, as I understand. It was intact and frozen. We do not have creatures like that now. But through them it shows God did not put on his ice maker all at once. Because animals began to grow longer hair. An animals environment can bring about changes. There are islands that have birds that do not fly, they cannot fly. They are just walking around with partial wings, because the thing about it is, they have no predators. If they would have had predators, then they would have been able to fly. But there are no snakes, no lizards, scorpions, or anything like that there, there is nothing to bother them to make them fly. You see that happens whenever things are let alone. Animal life is peaceful. When Satan took over in the beginning there were no predators. So I will have to say the animal kingdom were not giants in the first creation. I look at Genesis 6 in the time of man, whenever the sons of God began to look upon the daughters of men, that they were fair, then what happened? There became giants and intellectual people just like they are today. They do not recognize God. To them, there is no God. The animals of the first creation were small creatures before Satan started to pervert creation. It was just like Genesis 6 whenever it began to happen. What happened when man’s creation became perverted? They began to cross, the sons of God to the daughters of men, looking at them that they were fair. Then giants began to appear. The scripture gives us enough insight to form this picture. Let me go back to Ezekiel. It is amazing how these men, Isaiah, Ezekiel, Peter, and Paul, men from the Old Testament to the New Testament, how they could look at these things. It had to be God inspired. As I look at this next scripture it is pointing to a fall, but it was not the fall of man, it was the fall of Satan in the creation before man was here. Let us look at it, Ezekiel, chapter 28, starting with verse 11. “Moreover the word of the Lord came unto me, saying.” What is he saying there? He is saying the word of the Lord, so it was not some kind of fancy idea or some kind of thought. This is what is happening today in this hour, the message is not just man’s thought. It has to reach down deeper to pull out the things that are relevant for the day and time in which we live. He said here, moreover the word of the Lord came to me. In other words, God spoke to him. Whenever you read over that, think about it, God speaks, because God knows. He knows the thoughts and intents of our hearts. He knows what we are going to do with what we have and what He has given us. He knows that. “Son of man, take up a lamentation upon the king of Tyrus, (He is using a king here, a lamentation upon the king of Tyrus. He wants you to think of an individual first. He is comparing a man to what happened before our creation when Satan fell. Take a lamentation upon the king of Tyrus…) and say unto him, Thus saith the Lord God; Thou sealest up the sum, full of wisdom, and perfect in beauty.” He is already skipping the man, into the revelation that God has given him, because he is looking at somebody that has become famous. He is looking at a king that has had a lot of success in the world, not success in God. Satan’s success was not in God. His success that he was looking at was the success in changing things. He wanted to change everything, just like today, they are changing the word. They will write all different kinds of Bible types and everything, in order to get you away from the real meaning. But it does not work, not with the saints of God. Let them go, let them have their way about it. All different translations, let them have it. “Thou hast been in Eden (See? He is going back, another Eden, not our Eden. He is going back before our time, before the Ice Age. These people that built the replica of Noah’s ark in Kentucky, it is a beautiful place to look at. I have not been there, but they have dinosaurs in there and everything else. Why? They built a building, but they had no revelation. If they had, then they would have put it the way it is in the word. But they did the best they could with what they got. That is what man does. He does the best he can, that is why they build these great big churches. Here people come in and fill them and spend a few minutes listening to a bunch of stuff that is going to make them feel good. This is a feel-good day, if we feel good, then it is alright. You can feel good about the word of God, but you can see the fallacy in man. Thou hast been in Eden, See? Thou hast been, it was prior.) the garden of God; every precious stone was thy covering, the sardius, topaz, and the diamond, the beryl, the onyx, and the jasper, the sapphire, the emerald, and the carbuncle, and gold: the workmanship of thy tabrets and of thy pipes was prepared in thee in the day that thou wast created.” Oh, he loved this famous music. God does not like racket, God likes music. There is a difference. Men are glorifying the people that will get out there and express themselves in some indecent way, they think that is beauty. A woman can get out there (I would not say half clad, they are not even half clad) and they sit and swoon over some indecent thing on television. Once it was locked behind doors in the bad part of town. Now it is in stadiums and all these places, just to glorify the flesh. They care nothing for God. The church world is the same way. Men with long hair hanging down their back, they are filthy. You are not worshiping God, you are worshiping the flesh. “Thou art the anointed cherub that covereth; and I have set thee so: (God gave him his opportunity. God did not take away the opportunity from him of choice. What a fall. What a fall! He was not satisfied with killing the animal kingdom. This is where it all happened right here, in these verses of scripture. Ezekiel describes it right here. Thou art the anointed cherub that covereth; and I have set thee so…) thou wast upon the holy mountain of God.” God lifted him up. He was upon the holy mountain of God. He was in high places. He had influence. He was gaining influence. As it said in Revelation 12, a third of the stars fell with him. What for? For destruction, because they had a choice. God put this heaven and this earth in its place, and He gave the angels a choice. He did not make a bunch of robots. He made angels to worship Him. But then they got other things in their minds. This did not happen overnight, it took time. God has all the time in the world because He is eternal. We came to this, 2004 ½, what happened? What happened to many of them that left? They began to say “Oh, Bro. Jackson made a mistake. It is just like Bro. Branham saying that it should all be over in 1977.” Mockery, that is what it is whenever man begins to think. That is what happened with Satan, he began to think. God gave him that ability. All the time this was going on, God was looking right down at you this morning. When He created the heavens and the earth, He had you in mind because He was looking for somebody, not fallen, but He was looking for somebody to raise up. He put us in a level with His own Son. The ministry stands in Christ’s stead. He is not here, but we are, with His spirit. He gave us His spirit in order to fulfill His purpose. “Thou wast upon the holy mountain of God; thou hast walked up and down in the midst of the stones of fire.” Was it a thousand years? Was it five years, five hundred years? God has a Millennium coming up, which He binds Satan for a thousand years. He gave him that much long or longer. He gave him time to make a choice. Here he is integrating his thought, the thought of his mind, he is putting that within the mind of other angels. He is an anointed cherub. He is one of the top angels, along with Michael and Gabriel. He was right up there in the plan of God, in the working of God. It said until iniquity was found in him. “Thou wast perfect (perfect, perfection is everything. Whenever the church reaches her perfection, there is nowhere else to go but up. God will recognize that. Talk about unity, there is going to be unity or there will be nothing. I do not want to do it my way, because God’s way is better. Thou wast perfect…) in thy ways (more than one) from the day that thou wast created, till (until, it could have been a thousand years. It could have been ten thousand years. There was enough time for influence to take over. Because inside of him, he is gaining strength. He is gaining popularity. Oh, he mentions God, because he wants to be equal. Thou wast perfect in thy ways from the day that thou wast created, till…) iniquity was found in thee. By the multitude of thy merchandise (What is it talking about? All the gold, the stones, things that were mentioned here, he had these in his possession. They were his. God put them there. He put him in an Eden. You know what our Eden was, it was perfect. By the multitude of thy merchandise…) they have filled the midst of thee with violence, and thou hast sinned: therefore I will cast thee as profane out of the mountain of God: (What is it? The New Jerusalem is a mountain. What Satan forsook, you see all the different rubies and diamonds and all these things, back into the Bride of Jesus Christ. We have got it all. I am not bragging, I am saying what the word says in Revelation 21, read it. I will cast thee as profane out of the mountain of God…) and I will destroy thee, O covering cherub, from the midst of the stones of fire.” You see the diamonds, you see the pearls, what caused them? It was because of the heat of the earth. It formed all these beautiful things that we see. Many of them are still in the earth to be found at some time. God is sending His Son to come back, to get a beautiful bride. Revelation 19, verse 7, without spot. Without spot. He is coming back for a glorious church as recorded in the scripture. We are a part of that. What a great family God has. From here, to Norway, to South Africa, to the Philippines, all of these are rubies. When He comes, it says, to gather what? What does it say in the 3rd chapter of Malachi? He is coming to claim His jewels. You are jewels in His crown. Some are different things. What do you think it is there in Revelation 21? What is He talking about? He is talking about Bride people, making up that great mountain that is foursquare. “Thine heart was lifted up because of thy beauty, thou hast corrupted thy wisdom by reason of thy brightness: (Oh, he was famous.) I will cast thee to the ground, (Revelation 17, I will cast thee to the ground.) I will lay thee before kings, that they may behold thee. Thou hast defiled thy sanctuaries by the multitude of thine iniquities, by the iniquity of thy traffic; therefore will I bring forth a fire from the midst of thee, it shall devour thee, and I will bring thee to ashes upon the earth in the sight of all them that behold thee. All they that know thee among the people shall be astonished at thee: thou shalt be a terror, and never shalt thou be (What?) any more.” Never shalt thou be any more. Thou shalt never be any more, that means there is an end. There is an end to Satan. God will take that spirit right back to himself, that spirit that He gave.